Want to get the divine energy? 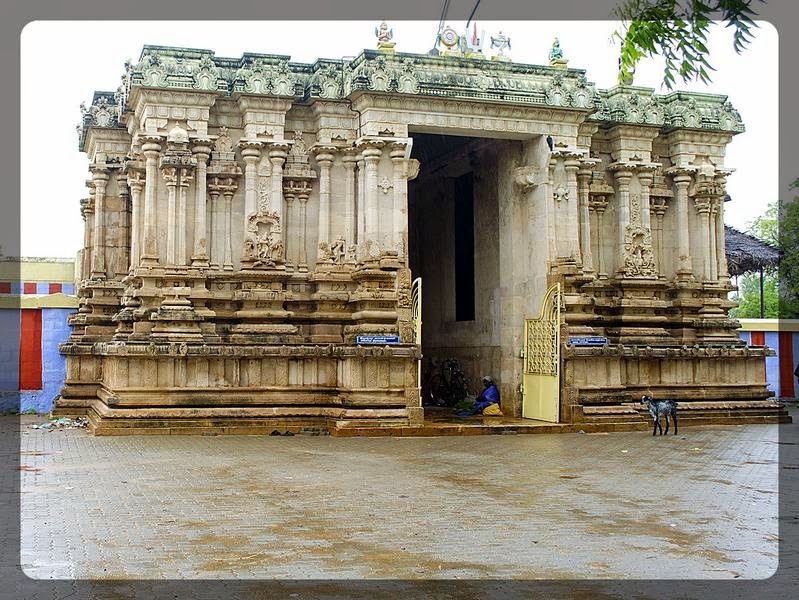 Then the sacred trip to Nava-Tirupati would help you achieve this. 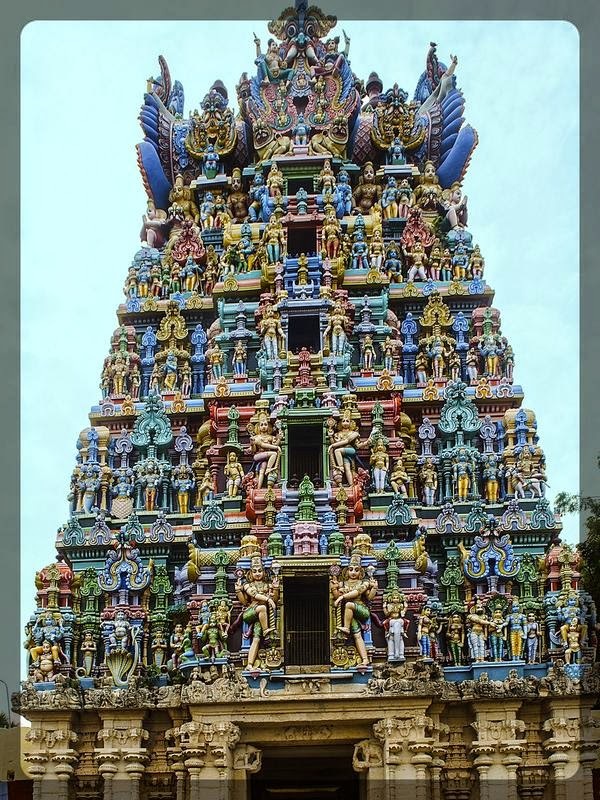 In the greenery of Tirunelveli district, on the bank of river Thamirarabarani (river having copper mineral) lies the beautiful 9 abodes of Lord Vishnu. 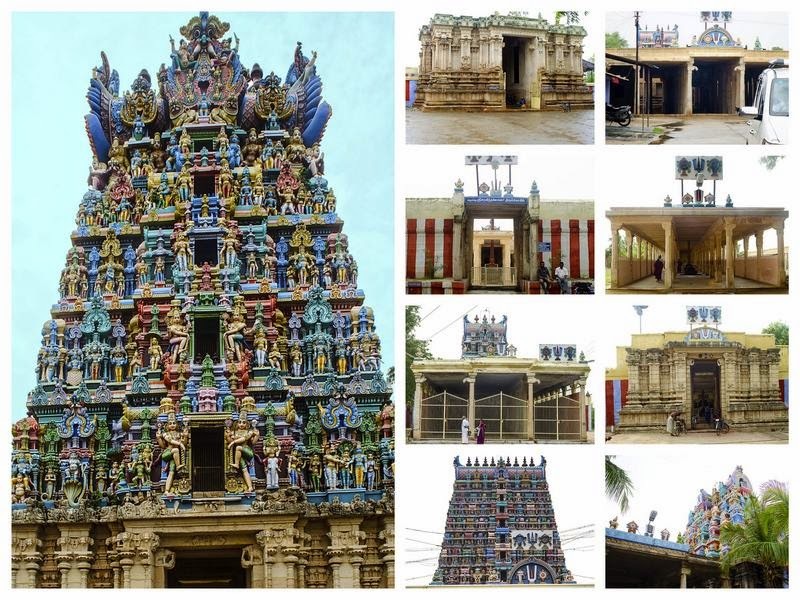 These are called 9 Divya Desham (divine temples) among total 108. The word Nava in Sanskrit means nine. One may wonder what is the significance here. It is said that Lord Vishnu represents Navagraha. Hence there are no separate Navagraha shrines here. Hmmm.. it is interesting. To explore all these temples one can hire an auto or cab. 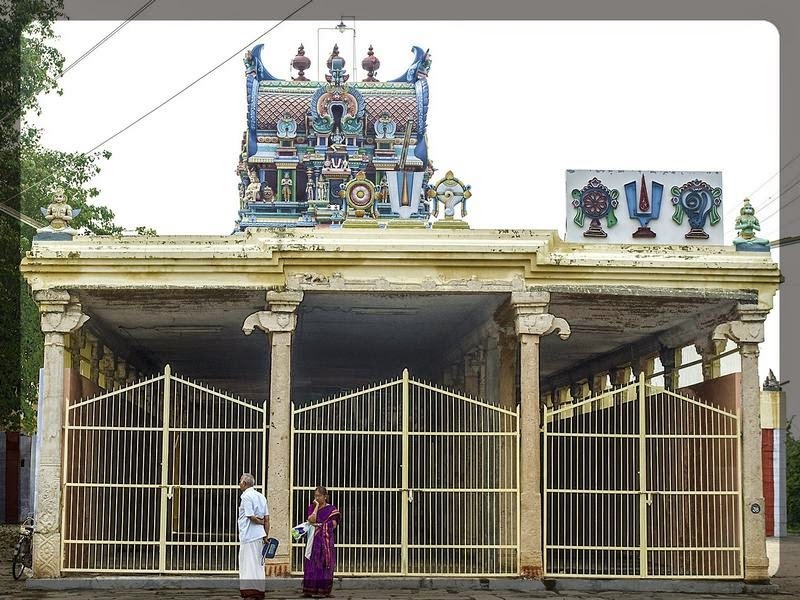 Devotees have the option to choose Vaikundam as a starting point and complete the trip at Azhwar Tirunagari or vice versa. We started from Azhwar Tirunagari and ended at Vaikundam. It is advisable to have a breakfast in Tirunelveli town, as we didn't find any decent hotels in Nava-Tirupathi. The main deity is Sri Adi Nathan who is in a standing posture. A birthplace of Nammazhwar. 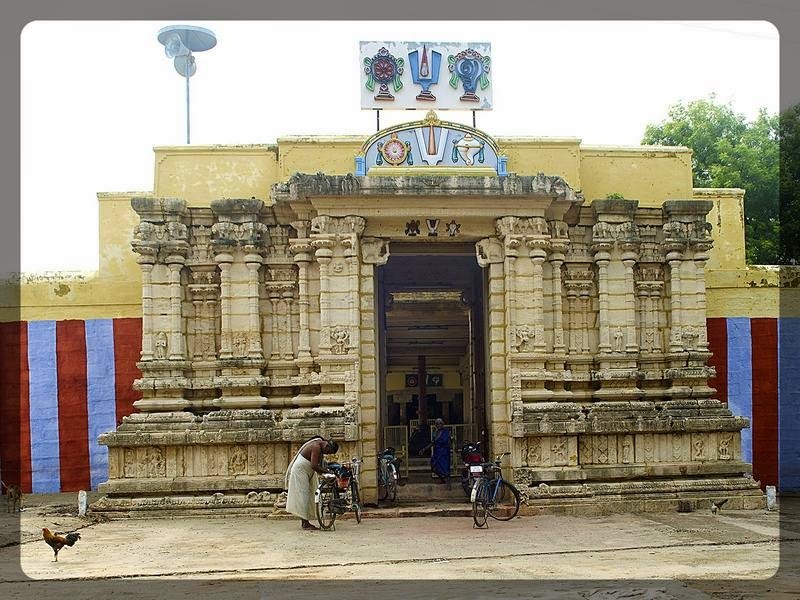 This place is also known as Kurugoor which was named after the ruler Kurugu. He was the great grandfather of Nammazhwar. The sthalavriksham (monumental tree) is Tamarind tree. This tamarind tree neither bears the fruit nor close the leaves in the night. Look out for this tamarind tree when you visit. It is believed that when Nammazhwar was born, he neither cried nor opened the eyes and was also speechless. So he was taken to this sthalavriksham and he stayed here for 16 years. Once Madurakavi Azhwar came and asked some interesting questions about the life, only then Nammazhwar started conversation with him. He is the only Azhwar who has sung in praise of Nava-Tiruphathi. He has contributed more to Naalayira (4000) Divya prabhandham. A separate sannidhi is dedicated to Nammazhwar. Lost the wealth or property? Don't worry. 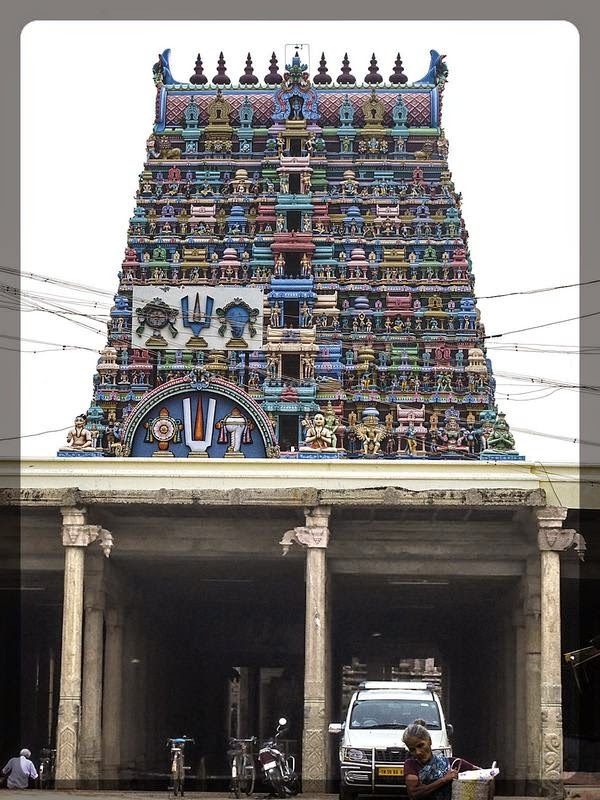 It is said that if surrender yourself completely on the feet of Lord Sri Vaitthamanidhi Perumal here, one would get back the lost property. He is gracing the devotees in the reclining posture facing East on the serpent Adiseshan. A birthplace of Madurakavi Azhwar. Once Lord Kubera losts all his wealth by the curse of Goddess Parvati. 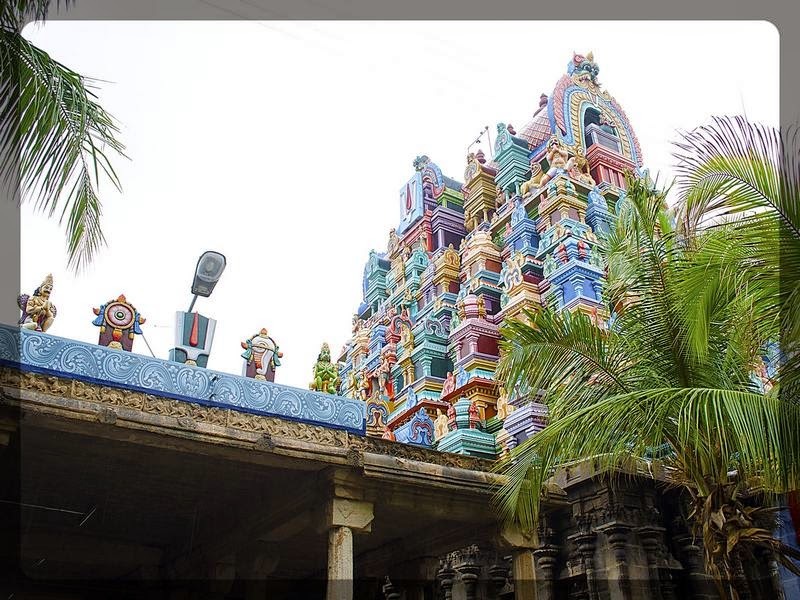 Kubera came here and worshipped Lord Vishnu and recovered all his lost wealth. Low rainfall or no rain in your area? Pray in Thenthirupperai to have a good rainfall. Why to pray here for Rain? An interesting story goes that the Varuna god (rain god) insulted his guru and got the curse from him. Due to this Lord Varuna was defeated by Asuras (demons) thereby losing all his powers and weapons. Later he did penance on the full moon day. The Lord appeared before him and Varuna regained his lost power and weapons. So it is believed that the rain god comes on the full moon day in the Tamil month of Panguni (March to April). The Supreme God Sri Makara Nedunkuzhaikkadhan is in a royal seating posture; welcomes all his devotees with his striking earings. It is said that once Neela devi was doing penance to get rid of Dhruvasa's curse, she found the beautiful fish shaped ear rings and offered this to the Lord. Hence the name Makara (fish), Nedunkuzhai (long one), Kadhan (eared person). Two temples are located 100 yards between them. 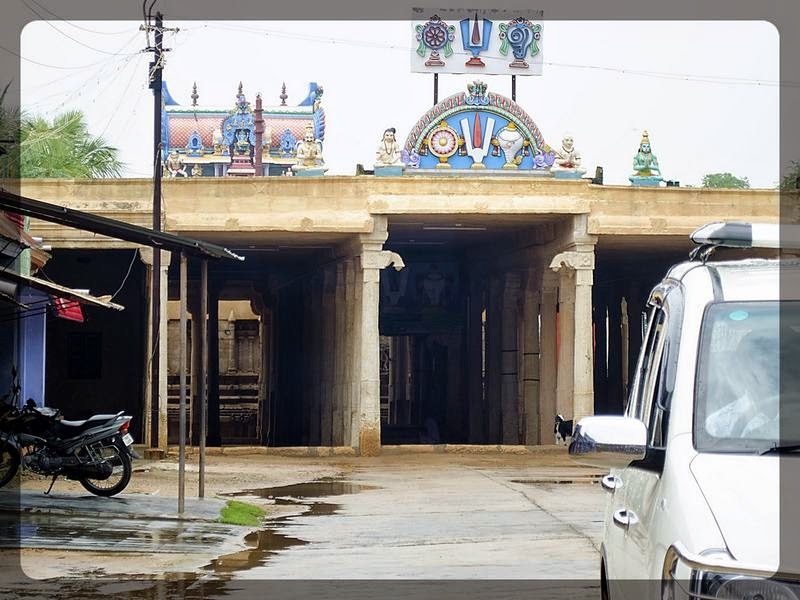 Temple is located in the village Thulai Villi Mangalam. The main deity in one of the temple is Devapiran who graces the devotees in the standing posture. 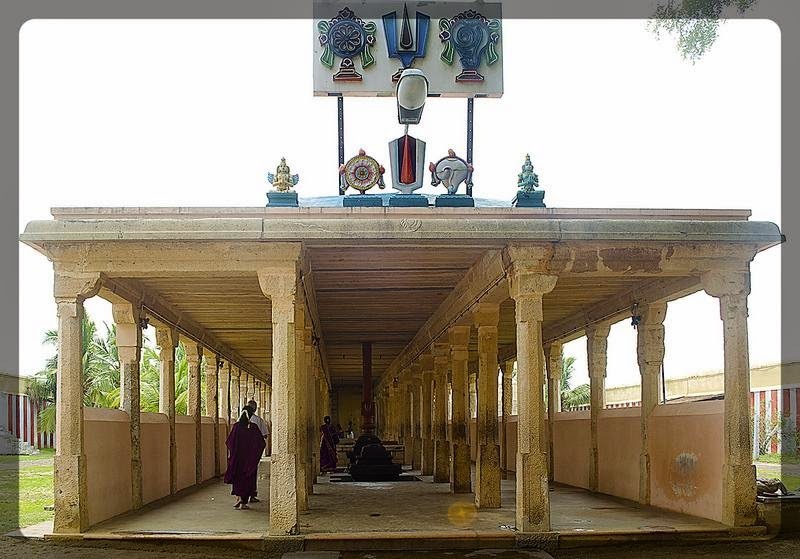 It is said that once the sage Supraba wanted to do the Yagna, saw the Thulai (measuring scale) and villu (bow). This was changed to young man and a women who were cursed by Kubera and they got the original form here. Hence the name Thulai Villi Mangalam. In the other temple Aravinda Losanar warmly welcomes us with the seating posture. Also named as Senthamarai Kannan. Had a darshan of Kaasinaventhar in the reclining posture with a rice measuring vessel as a pillow. The Brahma is seated in the lotus which has emerged from the Lord's navel. Have a darshan of holy Lotus feet of Lord from the small window when coming around the temple. Now called as Perunkulam and the main deity is Maayakoothan. It is said that once Lord Vishnu went on the Garuda Vahana to rescue Goddess Lakshmi from the asura and defeated. Then Lord performed the victory dance on the asura. Hence the name Mayakoothan. Also known as Nattam. 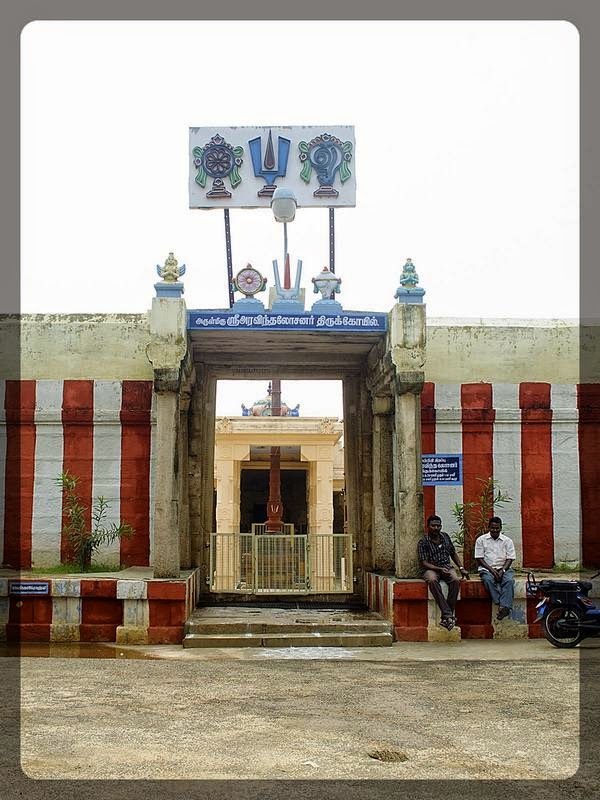 If you need moksham (liberation), visit the holy place where the Lord Vijayasanar is in grand sitting posture on Adisesha with one leg folded and the other touching the ground. An interesting story is that a poor brahmin boy wanted to get the darshan of Lord Vishnu and started to do penance. The Lord disguising himself as a brahmin, told him to do his penance in Nattam. When he penanced here, he was given darshan. The Lord Vaikundanathan gives darshan in the standing posture with Adisesha as an umbrella. Here the utsavar is known as Kallapiran. It is said that there was a thief by name Kala Dooshakan. Whatever he loots, he offered half of that to this Lord. One day when his gang was rounded up and was about to be caught by the guards he came and prayed the Lord to save him. Hearing this the lord went to the King in disguise as a thief. Hence the name Kallapiran. The notable feature is that the Sun rays fall directly on the Lord, on the 6th day of Tamil Month Chithirai (April to May) and Aipasi (Oct to Nov) every year.